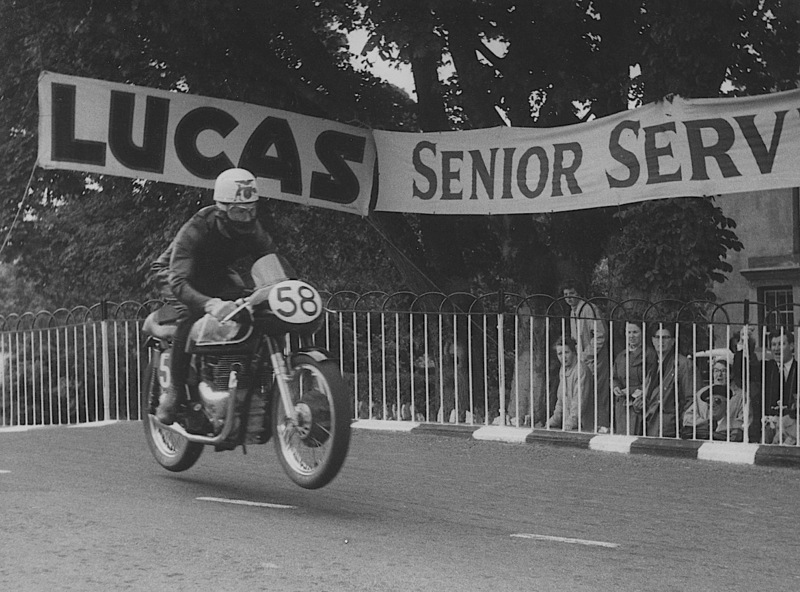 Leaping the works G45 Matchless at Ballaugh Bridge in the 1957 Senior TT. One thing never changes in top-level motorcycle racing; works rides are hard to find. The fact hasn’t deterred scores of Australian and New Zealand riders fighting their way into the big time, always with the hope that they will land that coveted factory mount. Story Jim Scaysbrook, Photographs from the Keith Bryen collection. Keith Bryen, who passed away on the NSW Central Coast in October, was one of the few who made it into a factory team – the illustrious Moto Guzzi squad for the second half of the 1957 season when his team mate, Victorian Keith Campbell, became Australia’s first World Champion. In fact he rode for two works teams that year, with an outing at the TT on factory-supported AJS and Matchless machines prior to joining the Italian outfit. Far from the stereotype Aussie racer, Keith was quietly spoken, quietly religious, and possessed of movie-star looks with his blond hair and square jaw. Born in western Sydney in 1927, Keith was a foundation member of the Merrylands Motorcycle Club and had a string of dirt ‘Miniature TT’ tracks in his area including Little Brooklands, Wynstannes, Wallacia and Blacktown. Like his mates, Keith was a keen road rider, petrol in those days being both expensive and scarce, so a motorcycle was the most economical (and enjoyable) means of transport. His first bike was a 1936 500cc BSA with a sidecar, but this soon gave way to a 1946 500cc Triumph Thunderbird, which was converted into a racer with the addition of megaphone exhausts. A 1937 500cc International Norton followed, which was also stripped ready for racing. Keith with his 1937 International Norton, stripped of its road equipment for Miniature TT racing. Working at Bennett & Wood, the BSA agents, Keith raced a 500 Gold Star but when Eric McPherson organised a job for him at AJS agents P&R Williams, with the opportunity to buy a new 7R AJS at staff discount price, he jumped at the chance, racing the AJS at Bathurst in 1950 and at Fishermen’s Bend in Melbourne, although without conspicuous success. He also bought a share in a new Mark VIII KTT Velocette, which he raced to a creditable fourth place in the Junior TT at Bathurst in 1951 – beaten only by Maurie Quincey, Ernie Ring and Harry Hinton, and just ahead of his future team mate Keith Campbell. The result whetted his appetite to race in Europe, and he spent the next 18 months working hard to accumulate the money. After selling everything in Sydney, he ordered a pair of new Manx Nortons via the NSW agents Hazell & Moore, and arranged to buy a van in England which would be his home for the coming season. While collecting his machines in time for the 1953 Isle of Man TT from the Norton factory in Birmingham, Keith met fellow Australian Ken Kavanagh and Rhodesian Ray Amm, both Norton works riders, and Ken loaned him a 35mm camera which Keith used prodigiously for the rest of the year, recording some wonderful images and furthering his interest in photography which he maintained for his entire life. On the road in 1953 – Ray Amm, Sid Willis, Tony McAlpine and Keith Bryen. The brutality of the sport was rammed home in the Isle of Man when Tasmanian Geoff Walker was killed in the Senior race – the first Australian to lose his life on the Isle of Man. Geoff had arranged to share Keith’s van for the rest of the season, so after the TT Keith set off alone for Europe, but soon linked up with Ray Amm and transported Amm’s 500 Norton to several events, which opened the doors to the booming Continental scene for Keith as well. Despite some reasonable results and a few quid in the bank, Keith was homesick and decided to call it quits at the end of the season, sailing for home on the P&O vessel Mooltan. It was an eventful trip home, because on board he met Gwen, who would become Mrs Bryen in 1955. Back in Sydney and having disposed of his two Nortons, Keith busied himself working on heavy machinery, but despite having a six-month layoff from racing, he couldn’t get the bug out of his system. After some soul searching he made the decision to go back to Europe; the plan being for his now-fiancée Gwen to join him later in the year. With two new short-stroke Nortons ordered, Keith bought a Bedford bus and fitted it out in Birmingham prior to setting off to the TT. 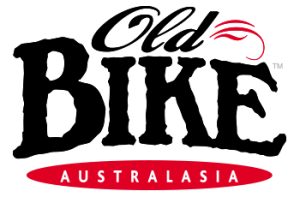 Tragically, South Australian Laurie Boulter, who had made a spectacular TT debut in 1953, was killed in a road accident while learning the course, and Keith was offered Boulter’s spot in the official Australian team. After recording good times in practice, the 350 Norton stopped early in the Junior TT, and the Senior, run in torrential rain, was cut to just four laps. Frozen stiff and drenched, Keith soldiered on to finish a commendable 13th. But the euphoria of the TT result disappeared soon after in another wet event, the Ulster GP, where he crashed in practice and broke his collarbone. These days such an injury can be plated and screwed together, but 60 years ago it was sufficient to curtail the rest of his season. Once more back in Sydney, he sold his Nortons to Tony McAlpine and his UK-based Bedford to Bob Brown, married Gwen and tried to put racing out of his mind for good. He did a few meetings at home, including the 1955 24 Hour Race at Mount Druitt where he shared a Triumph Tiger 110 with Barry Hodgkinson to finish third outright. Once again, the wanderlust surfaced, and after having his nomination accepted to represent Australia at the 1956 TT, he and Gwen sold their house, order a couple of Nortons and sailed for England. This time he arrived in plenty of time to contest meetings in England, France, Germany and Belgium prior to the TT, where he finished a career-best 11th in the Junior. Back in England, he teamed with Triumph factory test rider to win the 750 class of the Thruxton Nine Hour Race. The second half of the year brought some good results – including his first International win at Clermont-Ferrand in France – but in his final scheduled outing, at Tampere in Finland, he was taken out by a local rider and sustained another broken collarbone, as well as breaks to his shoulder and ribs. This time the Bryens decided to brave the English winter, and Keith found employment at Norton Motors in Birmingham. He also arranged to buy two of the 1956 works bikes, so he had high hopes for the 1957 season. His first outing was at the Imola Gold Cup in Italy, but the race was only one lap old when Geoff Duke crashed his Gilera right in front of Bryen, who rammed the Gilera a fractured his big toe. A penitent Duke arranged to repair Keith’s Norton, but the injury required a plaster cast, which Keith cut off two weeks later so he could resume his schedule. For the TT, he accepted an offer from AMC to ride works supplied bikes – a 7R AJS for the Junior and a G45 Matchless twin in the Senior – which were entered via dealers Tom Arter and Bob Foster respectively. But Keith never got on with the AMC machines and regretted to decision to abandon his own ex-works Nortons, despite finishing 13th in both races. Back on his Nortons, Keith began a run of success that began with fifth in the Junior and sixth in the Senior t the Dutch TT, prompting the Guzzi designer Giulio Carcano and team manager Umberto Todera to offer him a ride on their all-conquering 350 in the following week’s Belgian GP – along with a fee of £150! He rewarded the factory with a solid third place, battling all the way with the work Gilera of Libero Liberati, while Campbell won the race comfortably. On his own Norton in the 500 race, Keith again finished third – two GP podiums in one day! He followed that up with a 350cc win in the international meeting at Norisring, Germany, then headed to Ulster where he and Campbell had no fewer than five Moto Guzzis between them. Once again Campbell won the 350 cc GP to seal the championship, with Keith second and with the fastest lap of the race, then Keith rode his spare 350 Guzzi to fifth place in the Senior. For a week prior to the season-ending Italian Grand Prix at Monza, Guzzi booked the circuit so they could test machinery, and in addition to riding the 350s, he was given outings on the new 500cc Moto Guzzi V8, but Campbell crashed the V8 in practice and put himself out of the meeting. Elevated to Guzzi’s number one rider for the 350cc race, Keith battled with a severe handling problem that caused the bike to develop a high-speed weave before pulling out after five laps. Nevertheless he had finished in fourth place in the 350 World Championship and endeared himself with the Italian factory, and had high hopes of being offered a contract for 1958. But shortly after flying home to prepare for the birth of their first child, a letter arrived from Moto Guzzi to inform him of their withdrawal from racing. It was a shattering blow, and after briefly considering a return to Europe to ride private Nortons, he made the decision to hang up his helmet. From the glamorous life of an international motorcycle race, Keith took a job in the service department of the Victa lawn mower factory in Milperra, where he remained for the next thirty years. Unlike his racing contemporaries in Europe like Jack Ahearn, Keith Campbell and Ken Kavanagh, Keith Bryen received little recognition back home. When he left for Europe he had scored few results, and his subsequent Australian appearances were few. Yet he was regarded overseas as a solid, reliable and talented rider, and no less a figure than John Surtees rated him highly. For his testimonial meeting at Brands Hatch in 1981, Surtees invited Keith to England where he rode a 7R AJS from Surtees’ stable. When Historic racing got under way in Australia in the mid-1970s, Keith was tempted back into the saddle again by stalwart Barry Ryan, who provided a 7R AJS. He also rode the ex-works 250cc DKW owned by South Australian Eric Williams at Amaroo Park, and in 1998 returned to the scene of some of his best performances, Assen, Holland to take part in the Centenary TT meeting where he was provided with a 350cc Ducati by the organisers. In retirement, Keith a Gwen lived in their modest home at Thornleigh in Sydney’s northern suburbs, where they remained until relocating to a retirement village. Whenever I was in the district, I would call by and enjoy a cuppa out in the back yard with the delightful pair. Often Gwen would call out to the next door neighbour, who would appear through a gate in the common fence and take up his customary position at the table. It was a long way from the nomadic life of the Continental Circus of Europe, but Gwen and Keith always seemed divinely happy and at peace with the world. A few years ago, Gwen’s declining health saw her confined to full-time care. Keith suffered a stroke in 2012 from which he appeared to have recovered, but he died suddenly on 22nd October, 2013. With the passing of Keith Bryen, one of the final links with the golden era of racing in the 1950s has also been severed. Fortunately, Keith’s love for photography has left us with a fabulous collection of photographs, many in colour which was rare for the period, and which he graciously made available to this publication some years ago. This article first appeared in Old Bike Australasia Issue 42.